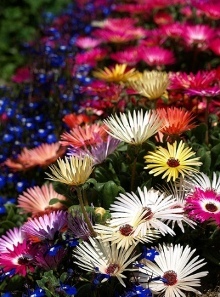 August may be a windy month, and can still get miserably cold, but it is also the month when you really start reaping the rewards of your carefully planned winter and spring flower garden; and as the month progresses the displays will just get better and better - banishing even the worst of the winter-blues. 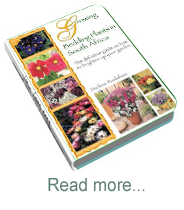 Because August is known as the windy month, ensure that all your standard plants and young trees are securely staked. There are many different types of tree stakes and ties, and different staking methods are used, depending on the size of the tree. Small trees can be secured to a wooden stake with a soft material like pantyhose or raffia, but larger trees will require very sturdy wooden or steel stakes and stronger ties. When securing your ties, ensure that they are not too tight, or they will damage the bark. Check the ties regularly during summer to ensure that they have not become too tight, causing damage to the trees. Garden 7 - A Measure of FormalityA ‘Sense of Place’ is the theme for this year’s Spring Festival at Garden World from Friday July 27 to Sunday September 2. 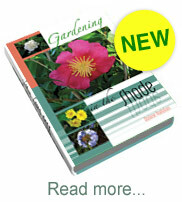 The challenge to landscapers creating the 17 show gardens is to design gardens with mood, atmosphere and personal style. 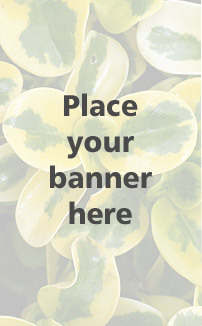 Participating landscapers include last year’s People’s Choice winner, Lizette Nieman of Strylitzia Landscapes, and other gold medal winners as well as new landscapers. The popular children’s gardens will be featured as well as display gardens by Rand Water and the SA National Botanical Gardens. 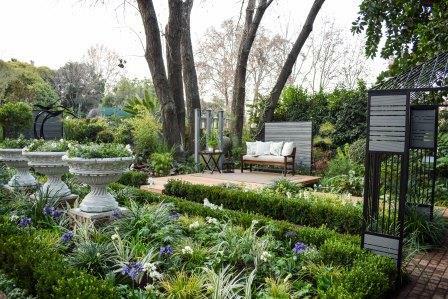 Arderne Gardens, Claremont, Cape TownA first this year will be Garden World’s very own ‘A World In One Country’. 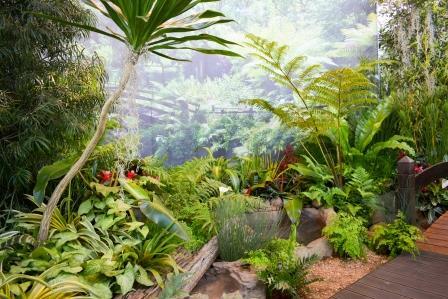 An exhibit which will feature settings of flora from The Table Mountain National Park in the Western Cape, Coffee Bay on the Wild Coast of the Eastern Cape, The Arderne Gardens with its shady glades, romantic nooks and ponds in Claremont in the Western Cape and a farm scene in Namaqualand in the Northern Cape. Inspiration: “This dust, this ancient dust of Africa has settled on my heart” - Pat Luckings. 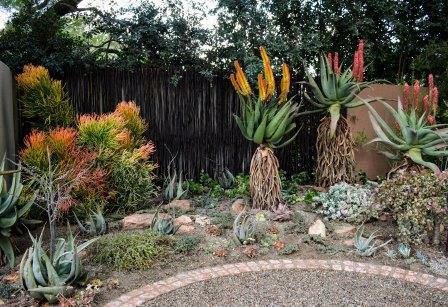 This indigenous garden that is inspired by African biodiversity showcases water-wise Aloes, shrubs and groundcovers. Aloes are the main focus with their stunning flowers that combine with their unique forms, foliage colour and texture. 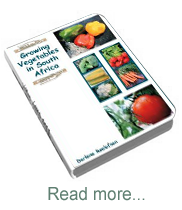 Looking at water scarcity in South Africa, gardening with succulents is the way forward. These indigenous succulents are well adapted to survive the dry and often harsh African weather. Every now and then we need to sit back, relax and detach from the loud city noises and get in touch with nature and this is the way to go. Inspiration: Munda Wangu which means ‘My Garden’ gives it a deep sense of identity and therefore my own personal “Sense of Place”. 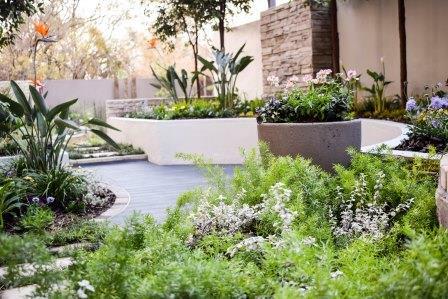 This garden is designed to suit both urban and country settings through carefully combined features, finishes and plant selections. This outdoor living space has both strong geometric and organic lines which define the deck and seating area spaces that make up the heart of the garden. A water feature welcomes visitors at the side entrance and is close enough for its soothing sounds to be enjoyed at the seating area.